Our Products >> FREE SHIPPING ARCTIC BOAT SERIES TEE SHIRTS. New for2016 is the launch of a series of historical boat designs from the arctic. Our first offering printed and available now is a Bardarka design, and a West Greenland Qajaq Shape. 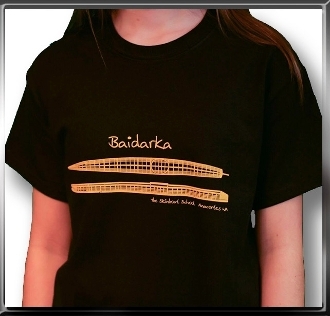 The shirts are 100% cotton and come in sizes from small – extra large. They are printed in house in a rich gold graphic on jet black shirt. We hope you enjoy wearing these as much as we had fun making them. Look for new added designs in the very near future. 2016 marks the Skin Boat Schools 25th anniversary. Thank you all so much for your support! FREE SHIPPING ARCTIC BOAT SERIES TEE SHIRTS.